Less than 80 of these cars made their way to the US in 1990, the only year the Cabrio was sold here. It was a bold and somewhat weird move by Yugo. Yugo sold over 48,000 cars in the US in 1987. By 1989 that number had dropped to less than 11,000. Introducing an expensive (by Yugo standards) boutique car to a country that was running away from their standard, cheap cars made little sense. Honestly, it's not a bad car. The top is power operated and actually fits pretty well. All Cabrios came in GVX trim. The engine is Yugo's 1.3 liter 4 and it has a 5 speed transmission. 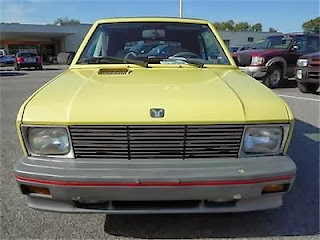 (Earlier Yugos came with a 1.1 liter engine and a 4 speed transmission. Oddly, while the 1990 1.3 liter engine in the sedan was fuel injected, the Cabrio came with a a carburetor. I have no idea why. My best guess is build date.) This engine / transmission combo didn't turn the Yugo into a rocket, but it was fun to drive in an old-school "keep the revs up" kind of way. I have a soft spot for the Yugo. While it was by no means a great car, it was a car with personality and personality flaws. It was a throwback to many of the affordable European imports of the 1950s and 1960s. On this Thanksgiving Day, after being thankful for friends, family, health and all the really important things in life, I am also be thankful that a few cars like this one still survive. 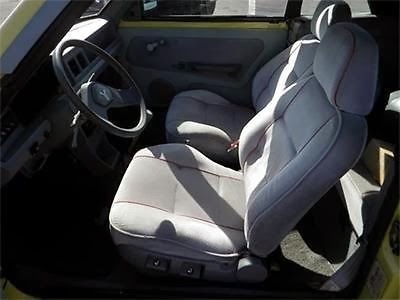 If you're looking for a rare, cheap car with tons of personality, this 14,000 mile Yugo Cabrio is worth checking out. Located in York, PA, click here to see the eBay listing. Love the Yugo cab! 14K, wow. Have a great Thanksgiving JACG! Happy Thanksgiving to all! Thankful for JACG, but also for so much more. Many years ago in my town, there were identical twin sisters who drove one of these Yugo convertibles(had to be the same color too). They were not teenagers at the time and one winter night, while shopping at our local department store, I was witness to one of the most beautiful sights I have ever seen. After shopping, the twins had just finished up adjusting and strapping themselves in their Yugo as they preparing to leave the parking space for the snowy ride home. I was preparing to leave my vehicle which I had just parked in the opposing space –grill to grill. I was driving my old work van, a ‘76 Ford E150 (former Bell telephone van with 3 on the tree). As all three of us occupied the same few square feet for that moment, they both looked up simultaneously, in their matching fur lined hooded parkers(like two lovely Eskimo girls), and we made eye contact. Me through my big Ford van windshield and them through the Yugo’s. I was stunned. To me it was the pure bliss of symmetry combined with the peace of uniformity and the wholesomeness of tradition, which ignores current trends. I could have gazed for hours at the “Eskimo girls” with the big fur lined faces and the same, super large plastic eye glass frames. The fresh snow falling down upon the Yugo’s windshield with the wipers on cut an arch topped frame of the identical visages. I was in love... what a blessing it was. My shopping trip(for a small microwave) seemed so pedestrian in comparison to what I had just witnessed. Two human beings, choosing to be the same yet totally different than the rest of the world in the mid 80’s. Happy thanks giving to you brother and to all JaCG readers. I ended up getting a "race car" Yugo GVX as a finders fee for the guy that ended up buying it. The car had been in multiple issues of Grassroots Motorsports. I miss the Yugo GVX, it was a fun little car. It really turned me onto Fiats and Italian cars in general. 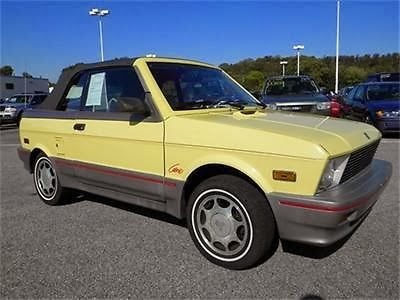 Yes, a Yugo Cabrio is uber rare in the US. The ultra-low miles make it something of a unicorn. But...it's still a far worse car than the Renault Alliance my wife was driving when I met her. There are very few cars out there eligible for that distinction. Maybe a Trabant. So, given that, I don't know what's more shocking: the fact that this dealer thinks its worth $5900, or that several potential buyers are willing to pay over $4000 for it. Geez, the original MSRP for the hatch version was only $4K. Clearly, the market has gone completely nuts. I'm always looking for a nutty small car- Renault LeCar, Justy, Peugeot 205 (as if!) ...Yugo. But jeesh- at this kind of pricing, you could easily get a 380sl or a super Saab convertible. This value is a tricky justification. My lord this is one of my Eleanors!!! And in the specific color combination (the other would be a silver Lancia Scorpion, red interior, solid flying butress...yeah, that specific). 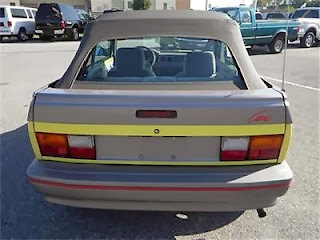 I remember scoffing at this car at the 1990 NY Auto Show esprecially in this odd color combination. But through the years, it has stayed in my head for some reason. I am unfortunately reading this some six weeks later so I am sure I am way too late to the party, but I will check out the ad.